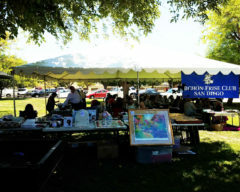 The BFCSD’s annual Garden Party and Rescue Raffle was held at the Saturday show where we did a supported entry. 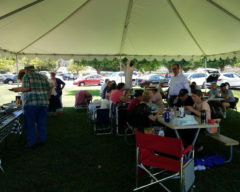 The weather was HOT but the gathering was in well attended and Gene had come through again this year with a huge tent under the shade trees. 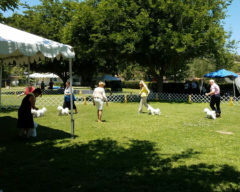 The raffle took in about $600 for bichon rescue and a personal campaign initiated by Jenny Listug leading up to the event brought in over $4,000 more for bichon rescue. BOB (and then a Group 4) went to GCHB FAIRSPRIDE MON ANGE DE MONACO “Ange” and he took home the Picnic Folding Chair. BOS Picnic Basket went to SCARLETS YOU’RE THE ONE “Carly“. 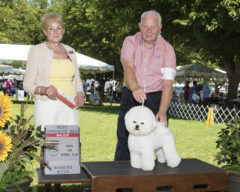 Congratulations to prospective new club member Jenny Listug and Oliver (SHE Bichons Oliver Norse) for taking Best of Breed from the classes including Best of Breed Owner Handler. And also to Lucie for taking Best Opposite from the classes. A great day. Thanks to all who worked so hard to make jt a success, especially the Mills, Michael Clayton,Sandy Phillips, Bill Johnston and Deb Gibb. It was a beautiful weekend! Congratulations to the Rescue Bichons and all the winners!